Update: Emergency rally to stop the Graham-Cassidy bill at Tillis’ office on Saturday, 9/23/17, in Raleigh. Organized by the Tuesdays With Tillis group in the Triangle. Rally with signs, singing, and chants; health care professionals in white coats and scrubs, people who will be directly affected by this obscene legislation; people on medicaid and the Affordable Care Act, women who depend on Planned Parenthood, and people who care about their neighbors and the 32 million Americans who stand to lose their health insurance if the Graham-Cassidy bill passes. Facebook event is at https://www.facebook.com/events/319083261892223/. SHAME on our US Senators from NC – Senator Thom Tillis and Senator Richard Burr – who hide from their constituents, and put party over country. 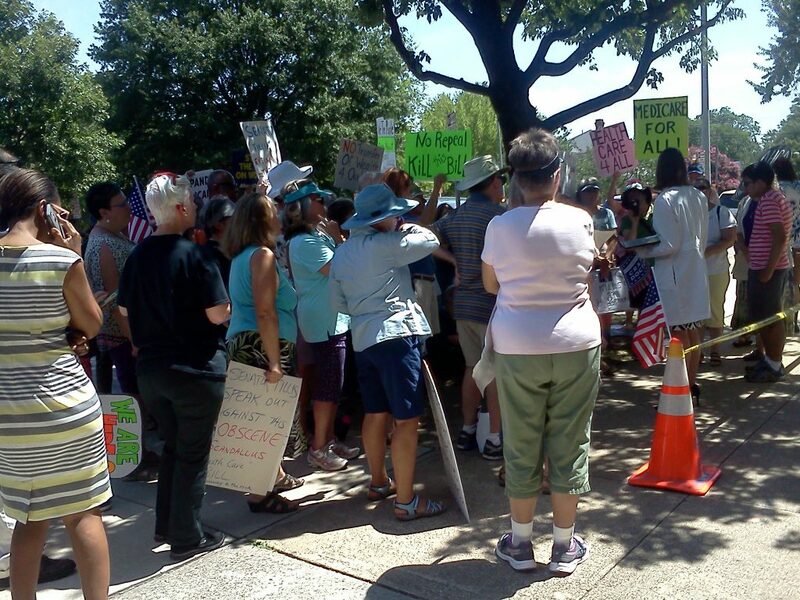 Senator Thom Tillis refuses to let his constituents near the federal building anymore because we protest. Outrageous. Well, we protest because he won’t talk to us. And we’ll be back. Thanks to Burr and Tillis, the Senate is proceeding to debate an unknown healthcare plan. Just one of them standing up for their constituents would have stopped this horror! The Affordable Care Act (ACA) has helped tens of millions of people – and the Republican Senate is intent on destroying it, and destroying these people and more in the process. NC residents -tell Senators Burr and Tillis that you know that they voted against providing life-saving treatment to millions of people in the United States. Tell them that they owe us better than that – improve ACA and use a decent bi-partisan process to do it. Calls are fast and easy! The Wheel of Misfortune was the coolest feature of the last “Tuesdays with Tillis” protest. 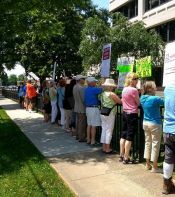 Citizens have been protesting in front of Senator Thom Tillis’ office in Raleigh every Tuesday for a few months at this point, but the protest really grew on 6/27/17. It was expanded with energy of some other groups – Protecting Progress In Durham and Progress North Carolina Action among others. 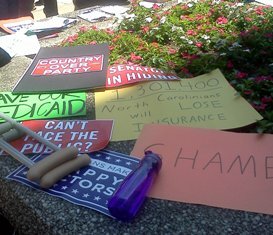 The message was to tell Senator Thom Tillis to vote NO on any “healthcare” bill that takes away coverage from anybody. 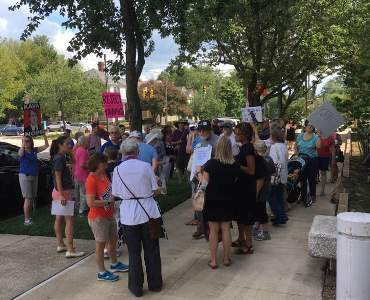 About 160 people went to protest at the Federal Building where Senator Thom Tillis has his Raleigh office, 310 New Bern Ave, in Raleigh. 160 people! The event had multiple parts. 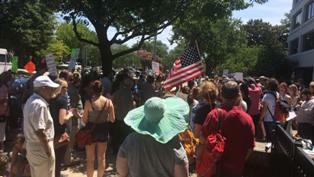 In the beginning was the regular Tuesdays With Tillis program – gathering, and marching in protest. Lots of great signs. While even President Trump described the House Trumpcare bill as ‘mean,’ his colorful verdict is an uncommon understatement as it applies to the House and Senate bills’ treatment of women’s healthcare. Trumpcare is ‘cruel’ to women, and especially harsh to North Carolinians. 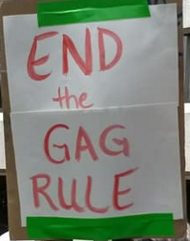 Trumpcare allows the elimination of women’s access to healthcare, letting insurance companies refuse to provide maternity care, slashing Medicaid payments (by $834 billion in the House bill/$772 billion in the Senate bill), and restricting Title X reimbursement. Medicaid is the nation’s public health insurance program for people with low incomes, the disabled and the elderly. The Medicaid program covers about 75 million Americans, or 1 in 5, including many with complex and costly needs for care. 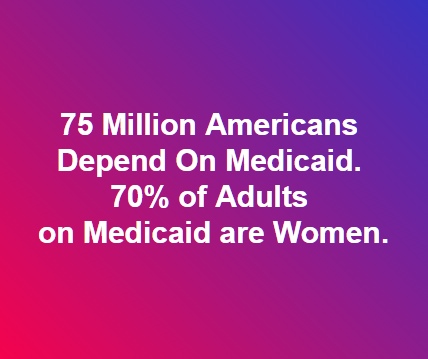 Seventy percent (70%) of the adults covered by Medicaid are women. Title X is a federal program which provides funding family planning services to people beyond Medicaid, like low-income women who are not Medicaid-eligible. Their recipients? Women. The Senate Trumpcare bill will cut Medicaid by almost $1 trillion dollars (that’s trillion with a ‘t’). These policies have disproportionate and disastrous consequences for women – young, middle-aged, and elderly, alike – especially in North Carolina. More than half of all births in North Carolina are covered by Medicaid – 54% in North Carolina in 2014, while other states vary from 24% to 72%, according to the Kaiser Family Foundation. Trumpcare allows insurance companies to refuse to cover maternity and newborn care as part of the 10 essential health benefits that insurance companies would no longer be required to cover. Protest Senate Trumpcare/AHCA Bill NOW! The US Senate is going ahead with another terrible version of AHCA, the so called “American Health Care Act”, aka Trumpcare. The nonpartisan Congressional Budget Office (CBO) estimated that version would cause 23 million people to lose health care coverage and end protections for many. These are protections like forcing insurance companies to cover people with pre-existing conditions. Multiple sources say the Senate plans to hold their vote before the July 4 recess. “[T]he plan is opposed by experts across the ideological spectrum, as well as groups representing doctors, nurses, hospitals, cancer patients, heart-disease patients and many others.” according to “Uh oh, Health Care Edition,” 6/8/17, NYTimes. Senate Majority Leader Mitch McConnell and other Republicans (completely shutting out Democrats and Independents) are planning to bring their health care bill to the floor before July 4 and there will be NO DEBATE, and NO AMENDMENTS ALLOWED. Also NO INPUT FROM THE MEDICAL COMMUNITY OR THE PUBLIC is allowed. This is outrageous and we need to let NC’s US Senators Burr and Tillis know that this is absolutely, totally unacceptable. “By acting fast, [Senate Majority Leader Mitch] McConnell hopes to minimize the continuing and mounting evidence of sabotage as insurers file rates in places such as North Carolina and Pennsylvania that explicitly break out the specific impact of Trump’s sabotage,” as Andrew Slavitt says in ‘Sabotage, speed and secrecy in the Senate. '” Andrew M. “Andy” Slavitt is a former Acting Administrator of the Centers for Medicare and Medicaid Services, a position he held from March 2015 to January 2017. Senators for NC – Burr and Tillis must be told again and again how bad this would be, and how they will be held accountable. We include a few ways to do this below. 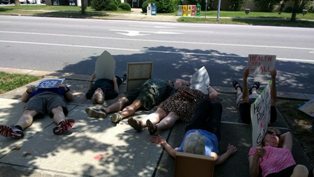 Above pictures are from the June 13 Tuesday with Tillis protest in Raleigh. Action: Stop AHCA/Trumpcare NOW! Here is how..
Did you write NC (US) Senators Burr and Tillis about stopping the AHCA (Trumpcare) bill yet? The AHCA bill that the Republicans forced through the US House on May 4, 2017 is devastating. “This bill will put women directly in harm’s way by making health care inaccessible to people with pre-existing conditions–including those who have survived domestic violence, experienced postpartum depression, or undergone a cesarean section. ” As NOW.org wrote in their suggested email action at http://now.org/wp-content/uploads/2017/05/AHCAEmailYourSenators.pdf. 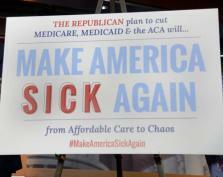 Congress’ own Congressional Budget Office estimated that 24 million people would lose health insurance from the plan. This estimate is from the March 2017 version of the bill that was not put up for a vote (due to expected failure), and the current plan (May 2017) is only worse. Read more about the harm this plan would do at https://www.cbo.gov/sites/default/files/115th-congress-2017-2018/costestimate/americanhealthcareact.pdf.